In this period of uncertainty resulting from the forthcoming Brexit, the members of the European Union are trying to prepare their countries for the worst. Last week, French Prime Minister Edouard Philippe announced a $56 million “hard Brexit” contingency plan in case the UK leaves the EU without a deal or with a hard Brexit deal (with high customs tariff). These investments should go to maritime and aerospace infrastructures. Indeed, the EU countries must prepare their infrastructure to deal with new customs practices, truck terminals, storage spaces and phytosanitary control for goods coming from outside the EU. French ports such as Calais and Dunkirk, which have almost all their traffic coming from the other side of the English Channel, are particularly exposed and not yet ready for this new challenge. At the same time, the EU Parliament has now included these French ports in the new shipping route linking Ireland with the Continent post-Brexit. The original decision, made in August 2018, planned to skip the French ports with this new route because of their modest sizes and due to the competition from huge Dutch and Belgian ports. The current routing of most trades between Ireland and mainland Europe utilize the United Kingdom as a land bridge. Considering the UK’s withdrawal, it is essential for EU members to develop the appropriate infrastructure, whether new or existing, to maintain trade flows between Ireland and mainland Europe. French ports such as Le Havre, Brest, Roscoff, Cherbourg and Boulogne have been added to the Atlantic Corridor. Calais, Dunkirk and Le Havre have also been added to the North Sea corridor. They will have to cope with increased goods traffic and should therefore receive increased grants and support from the EU. France defended her ports due to the geographic distance from the Irish coasts and to reduce the duration of the route compared to the Dutch and Belgians ports, which are still in these corridors. This is a very important topic for the Irish government as well. The EU is its largest trade partner and the Irish are highly dependent of the EU markets for their exports. 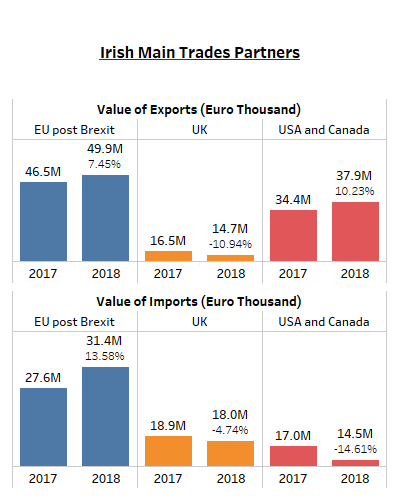 As things stand, France is set to become Ireland’s second largest EU-member trade partner (behind the Netherlands) post-Brexit.